Alessandro Blasetti and the Neorealists: A Review of 1860. By Jane McChrystal. 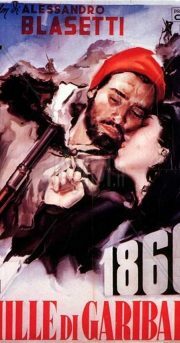 Sands Film Club* recently screened Alessandro Blasetti’s 1860 as part of its 1934 cinema season. Blasetti’s pioneering film has been credited with introducing a number of cinematic techniques which would become calling cards of Italy’s Neo-Realist directors, such as De Sica, Visconti and Rossellini, during the 1940’s and 1950’s. 1860 is the tale of a Sicilian shepherd, Carmeniddu, who is recruited to travel to Genoa and inform Garibaldi of the Sicilians’ uprisings against their Bourbon rulers. He journeys north by boat and train, gains Garibaldi’s ear and ends up by joining the force of The Thousand to return to Sicily and fight in the battle of Calatafimi, where the poorly armed volunteer force inflicted considerable damage on the Bourbon army. The film deals with a decisive stage in the unification of Italy, or Risorgimento, which was to bring together most of Italy under King Emmanuel Victor by 1861. While it shares the nationalistic themes of patriotic films turned out by Rome’s studios under Mussolini’s dictatorship, its use of ordinary people in leading roles and innovative cinematic techniques create a naturalistic style quite different to the bombastic productions of other Italian directors of the time. Films like Carmine Gallone’s Scipio Africanus: the Defeat of Hannibal, portrayed glorious moments of Italian history through the eyes of its great men and leaders, enacted by movie stars in true epic fashion. 1860’s protagonist, Carmeniddu, played by a non-professional actor, Giuseppe Gulino, tells a story of historic events from the view point of a naïve, enthusiastic young man who is fired by the cause of freedom for his people. A more sophisticated take on the complexities of the Risorgimento is provided by the Italians-to-be he meets during his quest, as they argue in a variety of dialects about their ambitions for a new united Italy. As one of the first Italian talkies, 1860 owes much to the Russian film director, Nikolai Ekk ,whose The Road to Life was a great success at the first Venice Film Festival of 1932. Under Ekk’s influence Blasetti dubbed the soundtrack onto his film in post-production with impressive results, considering the limitations of the available technology. Other technical innovations include filming on location and the use of match cutting to show action occurring simultaneously in Northern Italy and Sicily. The Neorealists were happy to acknowledge their debt to Blasetti, even if his rather ambiguous political leanings appear somewhat at odds with their clear left-ward stance. Blasetti concluded 1860 with scenes in Mussolini’s Rome, which seemed to draw favourable comparisons between his Black Shirts and Garibaldi’s Red Shirts, and were cut after the Second World War. But, in the end, history has been kind to his reputation. It is fair to say that, unlike Gulino, he was never one of Mussolini’s darlings, and the consensus is that he loved his country more than Il Duce. 1860 marks the beginning of the end of the reign of the Bourbons in the Two Kingdoms of Sicily. Although the Battle of Calatafimi was not an outright victory, it demoralised the Bourbon army, gave heart to Garibaldi’s Thousand and encouraged insurrection among the local population. Blasetti’s film memorialises a point in history when nationalist sympathies were mobilised to free Italy from external rule and recover its former prestige. However, the idea of being an Italian has never really outweighed a sense of regional identity in the Italian psyche. In 1860 four hundred and ninety four Lombardians and one hundred and ninety four volunteers from occupied Venetia joined the Thousand in pursuit of the dream of unification. On Sunday 22nd October, 2017 Lombardy and the Veneto returned a strong vote in favour of and increased local control over spending and legislation and greater autonomy from Rome.